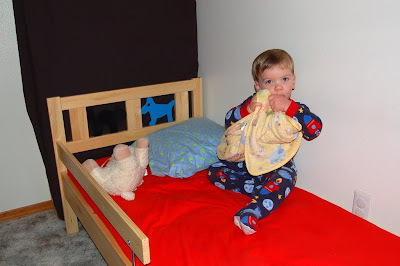 We decided that since Cory learned how to climb out of his crib it would be a good time to put together his big boy bed! Brian got it at IKEA last fall and it's so darn cute! It's called the kritter and has a little cat and dog in the headboard. 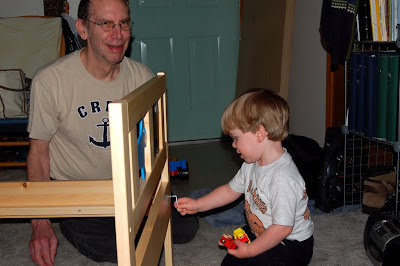 Cory wanted to help Papa put it together! It's been almost a week now and unfortunately he's having a hard time staying in the bed at night. Funny he doesn't seem to have the same problem at nap time (for which I am very thankful! ), but at night he's been up until almost 10. He comes and stands in the doorway where we can't see him, but can hear him. There is a black cat there, but you can't see it against the black foam mattresses we have against the wall. Here's hoping he learns to just go to sleep! He's such an adorable little character :) What a cute bed too! Cute bed! Don't worry; Cory will figure it out soon enough. Once the novelty wears off, he'll go to sleep earlier. My oldest did the exact same thing at 2 years, and my middle is currently in the same boat.